To view a selection of photographs from this book, please click here. Consecrated Ground: Funerary Art Of New Orleans, Lisa L. Cook presents a collection of her photographs taken over a period spanning 3 years. These haunting images show cemetery memorials as seen through the particular artistic eye of the author. A brief history of each cemetery represented in this volume has been included to provide background information on cemetery origins, and, also, to give the photographic subject matter some context. The work within this volume reveals a collection of artistic memorials ranging the entire spectrum, from massive, costly monuments spiking heavenwards, to the most humble, handmade remembrances. The graves depicted here are in various states of maintainance, from the pristine to the totally collapsed and desecrated. These opposites evidence what many consider uniquely characteristic of New Orleans. earned the sobriquet "Cities of the Dead". The majority of these tombs claim some form of architectural embellishment, but there are some heart-stoppingly beautiful ornamentations that set themselves apart, even from the average attractive tomb. The statuary, for the most part, are one-of-a-kind hand carved masterpieces usually depicting youthful, beautiful maidens or angels with their faces rendered into expressions of unbearable grief. However, there are a great number of cast-stone figures equally absorbing in their beauty. My focus is on detail of expression and variation of traditional styles. This book presents New Orleans funerary art as seen through my eyes and lens. When visiting these sacred places, and attempting to take in the whole atmosphere, sometimes intricate detail escapes notice. Hopefully, my experience of these remarkable cemeteries will be relayed somewhat from the flatness of the page. New Orleans contains over 40 cemeteries, so a complete presentation of all notable edifices would present considerable difficulties if confined to just one book. 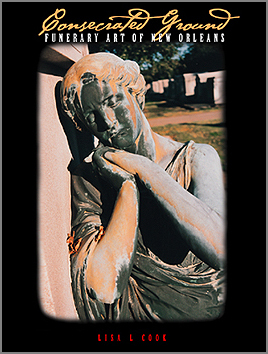 I have chosen nine cemeteries to represent some of the finest funerary art in New Orleans. A common thread shared by these nine cemeteries is the closeness of their locations. It can be a startling sight for newcomers to find themselves at the junction of City Park Avenue and Canal Boulevard, where, as far as the eye can see, there are cemeteries with acres and acres of graves. Lisa L. Cook is a native New Orleanian, a multi-media artist and photographer whose interest in funerary art and cemeteries dates back to her childhood. This oversize and heavy volume features a full color, matte-laminate dust jacket, sewn binding, and is covered in a maroon leather-like vinyl fabric. The dust jacket front cover depicts in full color one of the many photographs represented within this volume. Under the dust jacket, on the cover of the book fabric is a gold-stamped stylized crucifix measuring 8"w x 11"h. The spine is also stamped in gold, indicating the title, press and author information. Each volume weighs approximately 7 Lbs. The design and layout of the book is inspired and creative. The end papers are black and white, and are exquisitely detailed. The pages inside the book are from a heavy duty, fine quality paper. The book pages/photographs are printed in black and white. The photos themselves are predominately full page size (12"w x 15"h). The images are huge and detailed. There are nine chapters of cemetery photos, plus bonus chapters discussing funerary symbols and their meanings, forms of interment throughout Louisiana (necrogeography), and a complete listing of all New Orleans cemeteries including the address/locale of each one. Lastly, an index and bibliography are included. Since work began on this project 7 years ago, many of the memorials have been desecrated beyond repair or replacement. An unfortunate ring of vandalism and statuary/wrought iron theft, orchestrated by a prominent New Orleans antiques dealer, has left virtually no cemetery unscathed. Many irreplaceable works of art, which it must be remembered, were personal family memorials as well as breathtaking and moving works of art, are gone forever from their original placement. This volume also serves as a resource book, documenting many of the stolen memorials which are unlikely to be recovered and returned to the places where they once stood, undisturbed, for over a hundred years. Shipping: Books are best shipped via the Post Office's "Media Mail." This volume weighs 7 lbs, and is considerably more expensive to ship. Media Mail is a slower service, 3-4 weeks. Usually, it will arrive within 2 weeks. I do ship worldwide. Please contact me for a price quote.